As part of our work each year, Vanaajamaja organizes a community project during which a team of international volunteers builds or restores an old building that has some significance for the local community. Aside from the obvious goal of accomplishing this necessary building work, the projects are also about sharing the experiences, the sheer joy of working together and enjoying the process of giving and taking. 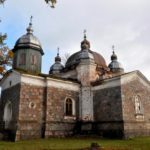 In 2017 NGO Vanaajamaja in cooperation with Orthodox Church of Estonia and local community has initiated a restoration project of Orthodox Church of St. Nikolay in Lalsi. The works are planned for several upcoming years. 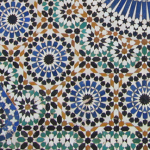 Two restoration workshops have taken place – in 2017 and 2018. Let’s see what happens in 2019. 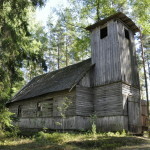 Vanaajamaja in cooperation with the Estonian Heriatage Board initiated conservation works of tiny wooden orthodox church in South-East Estonia, in Puutli village. In the fall of 2015 the log walls were reinforced. In the spring of 2016 a crew of international volunteers helped to restore the tower and change the roof cover to wooden shingle roof. 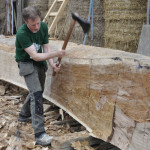 In cooperation with Estonian woodhouse Association there was a traditional timber-framing course tutored by Will Wallace-Gusakov in April 2014. The result of the course – a grill-house – was made (with the help of many generous sponsors) as a gift for Maarja Village – a home for young adults with learning disabilities. Estonian enterprise Hobbiton and NGO Vanaajamaja carried through an international community-service building project of covered wooden bridge in North-Eastern Estonia in August 2012. The bridge was built as replacement for former bridge flown away by spring floods. Over the course of four weeks, an international crew of volunteers from Estonia, USA, France and UK constructed and erected the Estonian first covered bridge. 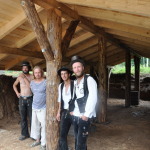 In 2010 we accommodated three German journeymen – Stefan, Arne and Simon – carpenters who, according to medieval traditions, were journeying three years around Europe before they could open up their own worskshops. In Estonia they spent a couple of weeks helping us to build a timber frame construction in Võrumaa. 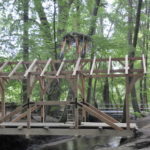 Lead by the Charpentiers sans Frontières the reconstruction of the entrance bridge to the Chateau of Harcourt, one of the medieval jewels of central Normandy, was organized in September 2018 and participated by 60 carpenters among which Andres Uus was presented. In the summer of 2018, the international Kesurokai meeting took place in cooperation with the Hanseatic city of Lüneburg. 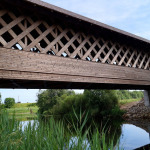 A covered wooden bridge was built with the 60 craftsmen involved from 8 countries. See the process in short. In 2011 Andres was participating in an international building project in Sanok, Poland. 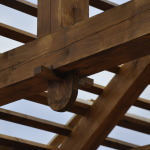 Under the leadership of the Timber Framers Guild a group of volunteering carpenters from all over the world were reconstructing a historic roof for the Museum of Polish Jews in Warsaw. 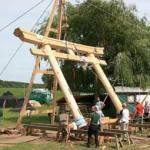 In 2007 Andres participated in the second European Kesurokai, in Mützingen, Germany where a traditional Japanese gate torii was built. The Kesurokai is a meeting place for European and Japanese carpenters and an opportunity to learn from each others skills, crafts and carpentry culture. Vanaajamaja participates in an international cooperation project in order to promote disappearing traditional building skills all over the Europe. In the REDIAPRO project a group of architects, vocational educators, built heritage protection organisations and training centres like us are networking in order to learn each others best practices and bring traditional building skills and crafts into the spotlight once again.